Sometimes you make the right choices. When you do, and they pay off -- even in a small way -- it feels good. While prepping the Blue Moon for painting, I discovered that the sacrificial worm shoe had paid the ultimate price for Blue Moon's health. It had done it's duty, and needed to be replaced. Actually, from the look of it, it had needed to be replaced for a good long time. What is a sacrificial worm shoe? 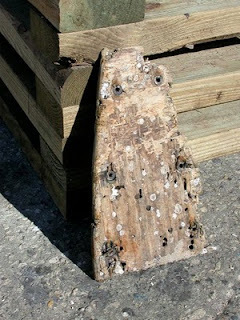 It is a small piece of wood, located aft of the lead keel, at the base of the stern post. This, typically, is the lowest part of the keel on a full keel boat, and thus the spot most likely to hit bottom in shallow water. 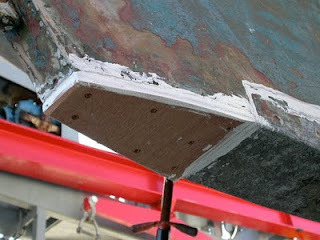 Hitting bottom is a great way to scrape off bottom paint, particularly if the bottom is rock, coral, or the vast collection of rusting metal junk at the bottom of most harbors. 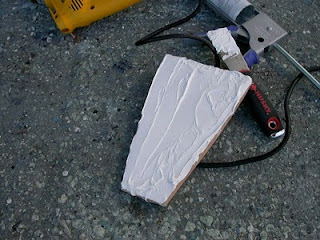 And, as I learned yesterday, scraping off bottom paint is equivilant to ringing the dinner bell for marine boring worms. Thus, instead of feeding the keel or stern post to the worms, clever builders install a small piece of replaceable wood in this location. If it's eaten by worms, you can throw it away and install another. As you can see from the photo above, my 'shoe' was fully sacrificed, and I needed to make a new one. 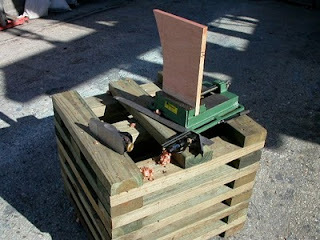 This gave me the opportunity to test my hand-tool theory. I've been collecting old tools that no one seems to want any more, specifically because I wanted to be able to fix things without being dependent on electricity. It so happened that I had plenty of electricity available, but I only needed a small bit of it. I first traced the outline of the shoe onto a scrap of mahogany left over from Cabin Boy's transom. I don't know if mahogany is a good wood for this purpose, but I had it with me and it has to be better than the piece of 1/2" plywood that the previous shoe had been made of. I figured if it didn't work out, no worries! I'd just replace it. I love wooden boats. My little portable vise was great... it didn't take up much room in my tool box, but it's really heavy and made sawing out the shoe (with my Japanese pull saw, of course) a snap. I trimmed it up with my block plane, and in practically no time, had a replacement shoe that was better than the original. Old and new shoes... Looks pretty good, eh? The next step was to bed the new shoe in place with a liberal slathering of bedding compound. I used 3M 101 sealant, because this stuff comes highly recommended for this purpose, and because I had an open tube in my box of stuff. This is not the place for epoxy. Either I, or some future owner, will need to replace this shoe someday, and I don't want to need dynamite to get it off. New shoe, with bedding compound liberally applied. To make the mounting process easier, I pre-drilled the counter-sunk holes in the shoe, positioned the shoe in place, and then drilled the holes in the keel. I used #8, 1 1/2" silicon bronze screws, rather than the hardware store round-heads that had held the old shoe on. Another improvement, I hope. The photo makes the joint look like an ice cream sandwich, but that is an illusion. 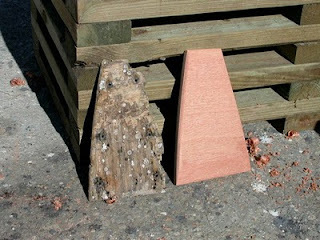 The bedding compound is probably 1/8" thick, and the piece of mahogany is 7/16" thick. But when I removed the excess compound with a putty knife, it smeared on the edge of the shoe. It's really mostly wood, and a thin layer of compound, not the other way around, as it looks. Note the end of the lead ballast keel to the right. Again, the joint between the keel and shoe is about 1/8" of bedding compound, but that stuff smears like anything. And that is what you call a hand-tooled shoe. A small accomplishment, but very satisfying. I love reading all of what you wright. Another beautiful job done again. What is really great is seing all this before I have the need myself. I presume you are going to bung plug and cover those flat head screws, right? On another matter relating to keelsons, you should look into getting a specie of wood called Ekki from Africa. This stuff is so frigging indestructible that when I tried to form it with a hatchet, sparks flew off the hatchet. A SOB to work for sure. But nothing is more durable. Purpleheart from South America is also a reasonable chocie for keelsons. In fact the Amistad replica at Mystic has a purple heart keelson. Great repair. While Matt has some good suggestions for tougher lumber species, you don't want them here. You really DO want something that's easier for the worms to digest. Better they eat this piece than the rest of the boat. Makes the plywood sound an even better choice. Sorry about the bad URL. The scripts that Blogger use for comment editing functions are atrociously bad. Cut and paste does not work, giving one no alternative but to type, or mistype, URLs and everything else. The cursor keys are also disabled, making it difficult to do any editing within the comment. Beyond that, this is the only blog I've seen with a multiple stage comment process. Much of the rest of the comment form is not available until the "post comment" button is pressed. Then, one must do more, including the idiotic CAPTCHA. Overly complicated scripts, multi-step processes for simple things, and horrible accessibility are the attributes that best define Blogger. Junk of the highest order. (Former life spent as a web standards geek who is appalled at how many stupid ways people can defy standard practices.) BTW, WordPress is orders of magnitude more compliant with industry standards. ... rant over. I might start a new blog -- unlikelyvoyager.com -- for my voyage up the east coast. I'll check out WordPress. However, I must say that from the blogger's perspective, Blogger is very easy to use. That form of spam prevention puts all of the onus on the readers. Everyone has to jump through the CAPTCHA hoop. As an aside, my most recent professional work was an an accessibility consultant, improving web technology for people with disabilities, notably the blind, low vision, and hard of hearing users. CAPTCHAs are nearly an impenetrable barrier for most of those folks. Even fully abled people get CAPTCHAs wrong almost 20% of the time. The real way to eliminate spam is behind the scenes with technology that is community based and incredibly effective at recognizing spam, both as raw spam and as stuff that other people have identified as such. WordPress uses a behind the scenes spam service called Akismet. It has been 100% effective in the several years I have used it. No one visiting any of my blogs ever has to pass a CAPTCHA test. I turned off the CAPTCHA filter. Will see how it goes. Thanks, Bob.